As part of UNLV Police Services' emergency response preparedness, the department will be conducting its hostile intruder response training on: July 26, Aug. 2, Aug. 9, and Aug. 16. This drill is designed to help ensure the safety of students, faculty, and staff. Please note that this training is closed to the public. The training and preparations will run throughout each day from 8 a.m. until 5 p.m. at the EPA Complex on UNLV's Maryland Parkway campus. 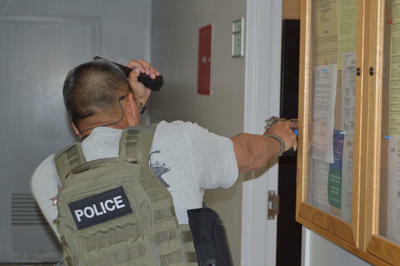 During the training, which features multiple scenarios, UNLV police officers enter a building after receiving a mock call from Police Services' dispatchers of a gunman on campus and shots being fired. A mock shooter is hiding in one of the rooms of the EPA Complex. Officers quickly enter and clear each room in the building. The scenario ends after the mock shooter attempts to fire at officers before the officers apprehend the suspect. Please be aware that during the training, you may see small groups of uniformed UNLV police officers and training personnel on campus engaged in realistic training scenarios using disabled, blue-tipped weapons with non-projectile blanks. If you have any questions or concerns regarding these training sessions, please contact Assistant Chief Jeff Green at (702) 895-2642 or at jeff.green@unlv.edu. To receive notification of Police Services news and events, check us out on Facebook and on Twitter. Learn more about the department on Police Services website.